J.P. Chenet Colombard Chardonnay is a popular French White Wine available from DrinkSupermarket.com in 18.7cl to buy online. 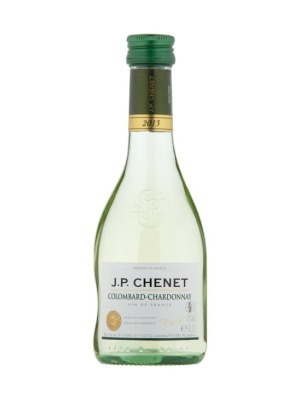 Visit DrinkSupermarket.com for the best price for 18.7cl of J.P. Chenet Colombard Chardonnay or compare prices on our other French White Wine products. The grapes are harvested before they are entirely ripe for perfect health and then crushed rapidly at a low temperature. Fermentated at a very low temperature (12-17°) to preserve all the aromas. Rapidly fined and conserved at a low temperature.A pleasant aperitif, this wine goes nicely with shellfish, grilled fish and white meat. Where to buy J.P. Chenet Colombard Chardonnay ? J.P. Chenet Colombard Chardonnay Supermarkets & Stockists. You can buy J.P. Chenet Colombard Chardonnay online in most retailers and find it in the French White Wine aisle in supermarkets but we found the best deals online for J.P. Chenet Colombard Chardonnay in DrinkSupermarket.com, and others. Compare the current price of J.P. Chenet Colombard Chardonnay in 18.7cl size in the table of offers below. Simply click on the button to order J.P. Chenet Colombard Chardonnay online now.